This year’s FUSED Festival came to a close at the Backstage Centre in Thurrock with a powerful world premiere of A Little Thing Called Life. Created and performed by RM19 – the Royal Opera House Thurrock Youth Vocal Group – the piece took inspiration from the themes of Giuseppe Verdi’s Requiem, cleverly mixing singing, chanting, rap music and hip-hop with drumming, guitar playing, clapping and inventive staging. 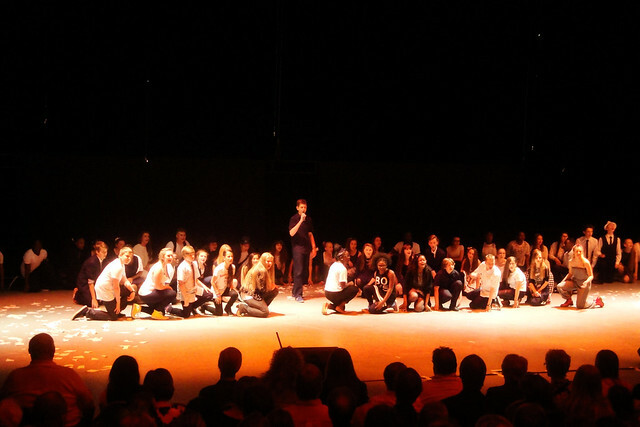 The 70 performers, many of them in their teens, delivered a compelling message about the feelings, desires, hopes and aspirations of young people. RM19 is free to join and open to anyone aged 11–25 who lives, works or studies in Thurrock. For more details and to find out how you can join, please visit our website. RM19 is generously supported by the Ernest Cook Trust, Julian Metherell, the Lucille Graham Trust, Bernarr Rainbow Trust and Thurrock Borough Council.